The following modalities are proven to coherently structure water in a life affirming manner, thus producing the highest states of healthy water. And almost all are included in how the WoLF works. Full Implosion Vortex – Open Air – Water is injected into the vortex and gravity fed in a downward spiral with a progressively smaller vortex air shaft center. It also must be in a non pressurized and open air system where the water drains out the bottom. Atmospheric gases exchange at the water’s surface in the vortexes center air chamber while energy also balances through it. (ex: Chlorine and other gases can escape.) The water MUST drain out the bottom to setup a complete and highly coherent energetic flow of a natural vortex. NOTE – Water structuring technologies that simply swirl water though pressurized pipes have some real drawbacks; one of which is that the pressure in the system reduces the effectiveness of the structuring process. Plus, the total sum of their vectors of change is but a handful. They don’t compare to over 308 vectors of change that are involved in how the WoLF works. Tap water input to the WoLF – first encounters an optional carbon filter which serves to protect the dual vortex system from particle contamination. The WoLF is self cleaning so water mineral deposits are extremely rare. The water then continues through a pressure regulating valve system. 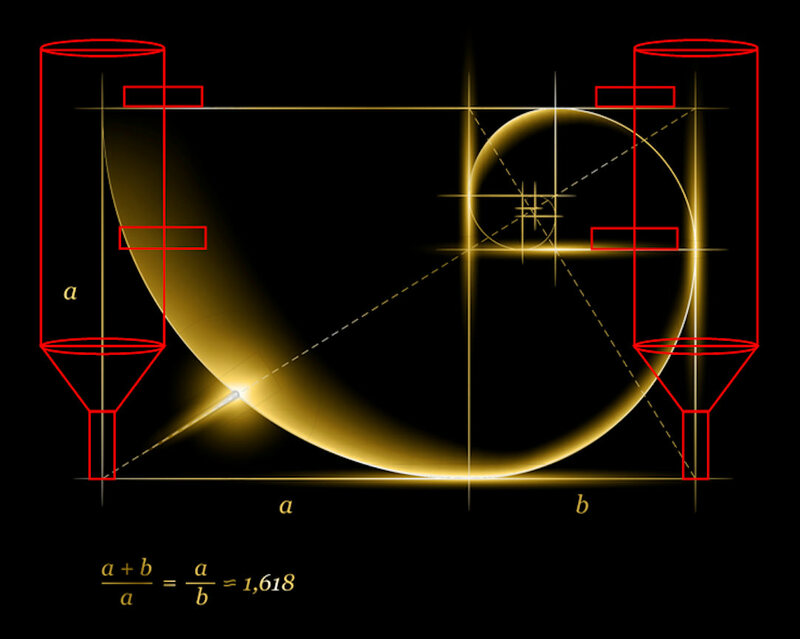 It is then directed to the Vortex Tubes into which the water is injected at the periphery in a tangential motion facilitating the formation of a stable, Phi Ratio geometry vortex. 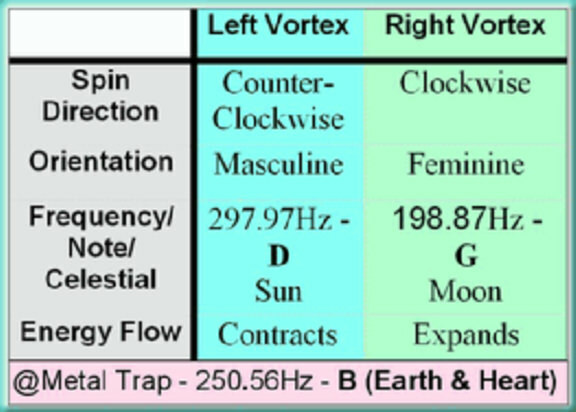 Looking from the top down, the left vortex spins counter clockwise and has a expanding masculine energy. 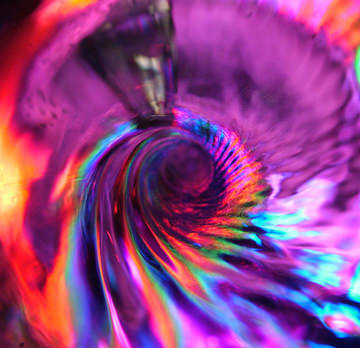 The right vortex spins clockwise and has an contracting feminine energy. From the top down, the entangled energy flow resembles an infinity sign as the vortices are also laid out in a Phi Ratio relationship. 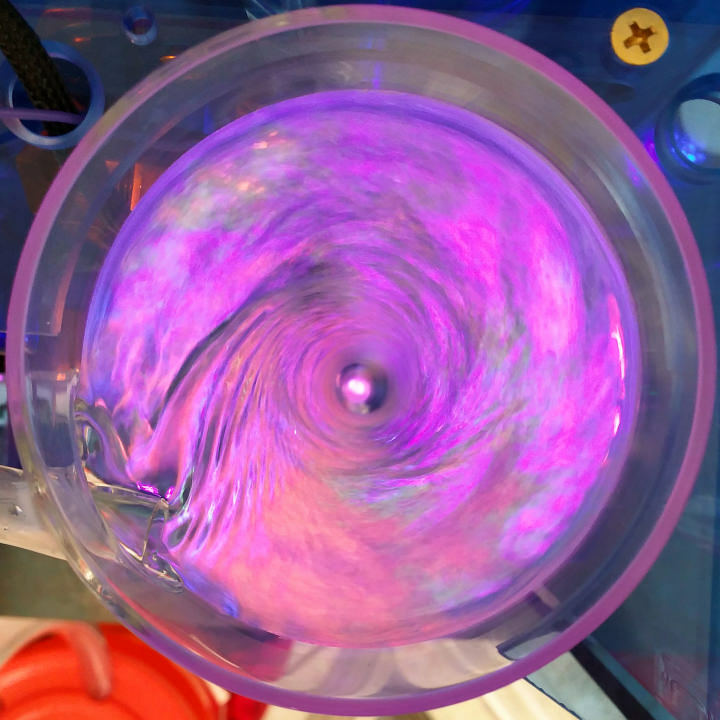 At the bottom of each vortex, the water explodes out and into the Impulser Assembly. With the Violet Ray Impulser, the 732 trillion Hz. frequency (Violet Ray frequency) is introduced to the water system. In a regard, this is the Heart of the WoLF – where the water is being structurally changed by the introduction of Earth resonant frequencies generated by an advanced and modified proprietary Tesla Coil Technology creating EM and etheric electromagnetic resonance. Quartz Crystal Piezoelectric Effect – and Homeopathic Silver Colloid generation assisting water structure. The vortex and impulse treated water then continues on its way and flows over special Custom Designed Crystals wrapped in nearly pure silver wire coils. The High Volts charge stimulates the piezoelectric ability of the crystals while the silver coils send and receive subtle signals to the crystal/water interface and a crystalline water programming ensues. This crystal technology borrowed from our Violet Ray Crystal Resonator device, is also critical to how the WoLF works. The holism of over 308 vectors of change emulate nature’s strength in diversity. This charged effect also embeds nano sized silver into the water cluster structures creating a homeopathic silver colloid and further increasing the coherence of the water structure. 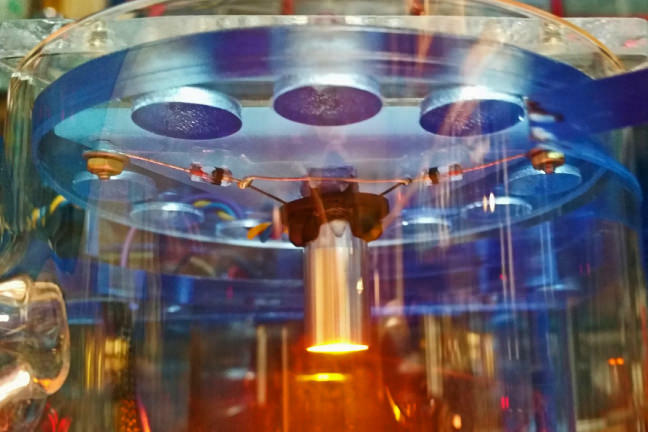 The silver wire coils are electrically connected to Triad “Etheric Information Field and Energy” Receiver Antennae installed at the top of the vortex tubes. 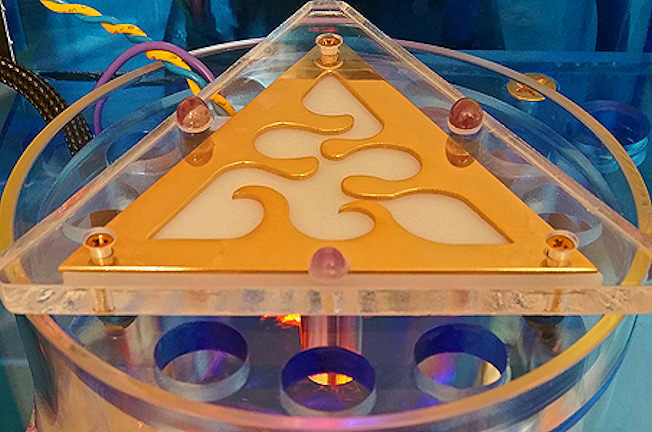 These Triad Antennae incorporate Amethyst Crystals, Germanium Diode Receiver Arrays, an ancient, sacred, Gold Plated Information Field Attraction Design and high intensity Light Emitting Diodes. 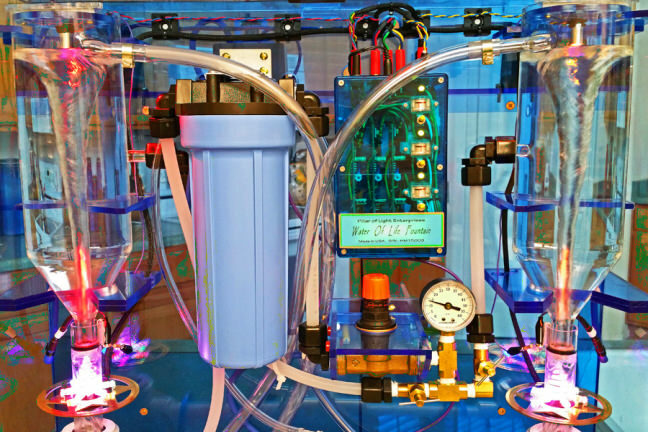 These Triad Assemblies charge the water with subtle field information and energy. They are also part of a Feedback Loop that regulates the entire system. 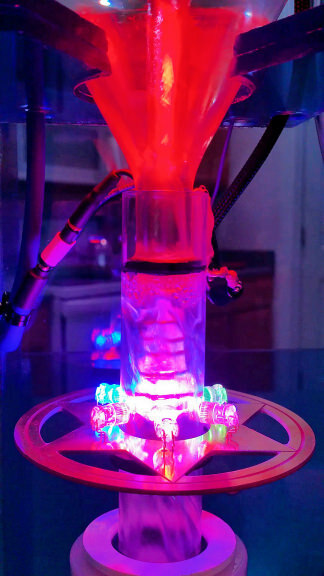 The High Intensity Vortex Tunneling Light Emitting Diodes (LED’s) are colored RED for the left vortex and YELLOW for the right vortex. The RED LED includes Infra-red light that can easily be felt as heat if you put your hand in front of it. Infra-red light is known to stimulate the production of what has now become known as the 4th state of water called “Exclusion Zone water” or EZ water. EZ water is beneficial and developed within all biological systems and represents yet another behavior that water takes on based upon the energy and information that is put into it. 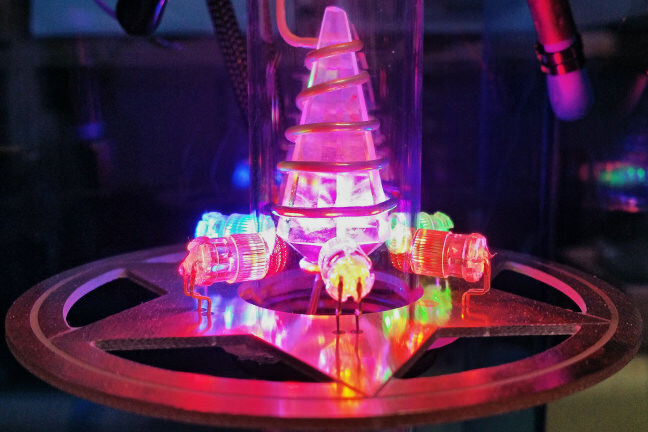 As the water flows around the charged crystal, it is also exposed to an array of light frequencies from 6 LED’s mounted on a gold plated “Earth Starr” Integrated Circuit Board. Each element emits a signature light color. That same light color can directly represent the element. 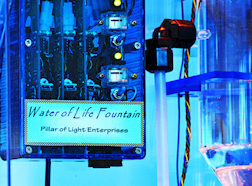 Projecting light color into water can homeopathically charge and program the water with qualities of those elements. 6 LED’s – Five of the six colored LED’s represent the most dominant elements found in the human body & add those vibrations to the water. 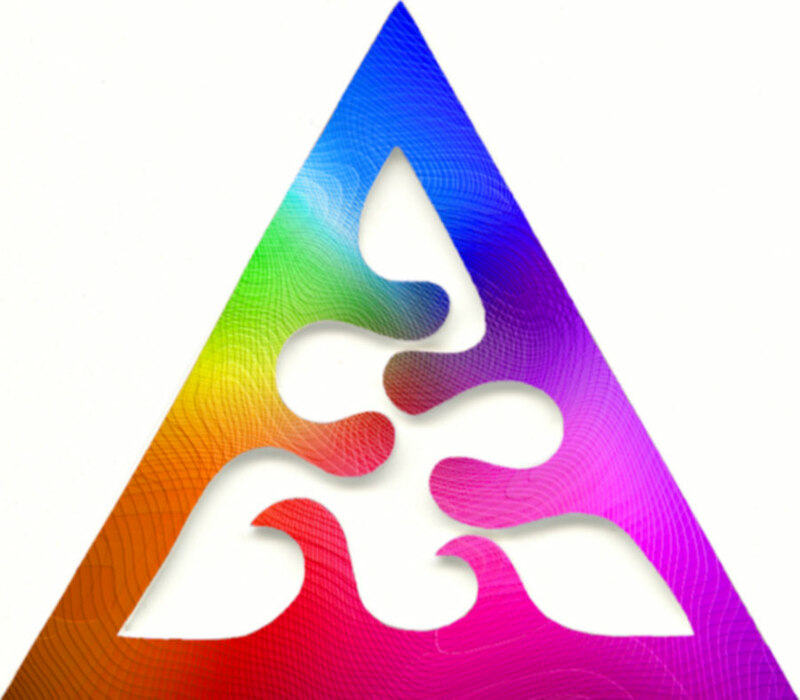 BLUE – Oxygen, RED – Hydrogen, YELLOW – Carbon, ORANGE – Calcium, GREEN – Nitrogen. And finally, the VIOLET LED represents Christ Consciousness. Earth Starr – The gold plated Earth Starr has 5 points with two concentric circles around it that concentrate the star geometry. 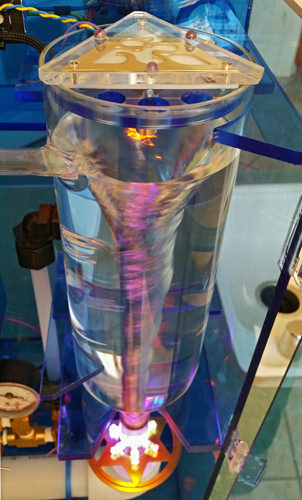 Combining Tube – Once past the crystal and the LED’s, the water enters the Combining Tube; affectionately called the “Sea of Tranquility.” This is the horizontal tube across the bottom of the WoLF in which the water is stabilized; allowing it to “digest” the prescribed treatments. Heavy Particle Trap – This Gold Plated contraption attracts metals like Mercury to it because of an electrical charge process. It’s a last chance to drain off any remaining contaminants before the output. Final Charge Screen – Just before the output, a gold electrode adds the 250.56Hz (Note B, Earth & Heart Chakra Frequency), which finishes the process. Notes D, G & B are a G Major Chord. This also helps to lock in the water programming. 5 month water memory – has been demonstrated by Emulsion Lifetime testing Click Here for more. The WoLF, a Twin Vortex Living Water Technology – is equipped with a fitting that accepts a regular garden hose for the water supply input. The outputs of the Heavy Particle Trap Drain & the Vortex Tube Top Skimmers, leave the machine via hoses which can easily go to a drain. And the main Structured Water Output of the WoLF has a gravity feed hose to a sink basin or a tank below which you provide. (For Counter Top Model) Whole Home Installations require customization. Continue on down for links to more details about how the WoLF works. What is water structuring? Why do I need it? Drinking and cooking with the WoLF structured water supports your whole being to be in balance with natural energy and have more vital life force. 3:44 min. video – Very nice.